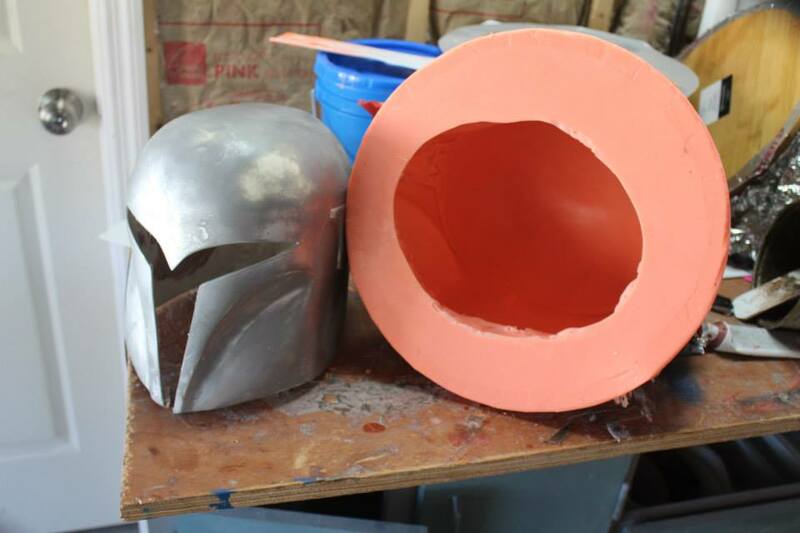 See how real-life versions of Sabine Wren's helmet were created -- and then presented to Star Wars Rebels stars Vanessa Marshall and Tiya Sircar. 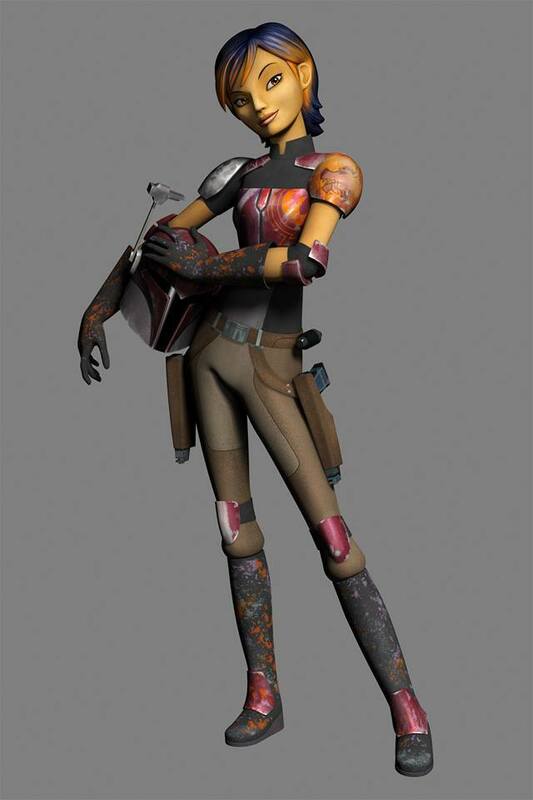 Sabine Wren is a 16-year-old Mandalorian, and member of the Ghost crew in Star Wars Rebels. By now I’m sure most of you reading this have either seen an episode, or watched several clips of the new cartoon Star Wars Rebels. So this story starts back in March of this year, when I was contacted by a Mandalorian fan via Facebook in regards to two Rebels voice actresses looking for Mandalorian helmets. 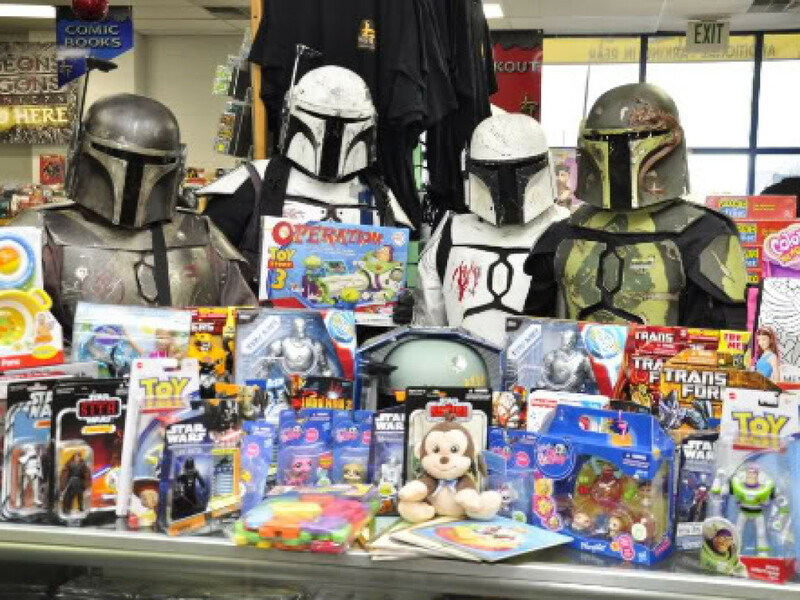 Apparently, one of them was on the verge of buying a Halloween costume-style Mandalorian helmet…and it was my job to save them from doing that. With that information in mind, I immediately jumped into action and contacted the only Star Wars prop maker who I knew was making helmets modeled after Sabine Wren — the Mandalorian of the Ghost crew on Rebels. After hashing out the details with the prop maker, I swiftly contacted Vanessa Marshall (voice of Hera Syndulla) and Tiya Sircar (voice of Sabine Wren) to see if they would be interested in having a professionally-made Mandalorian helmet. Once I received confirmation from Vanessa and Tiya, the prop maker went to work. 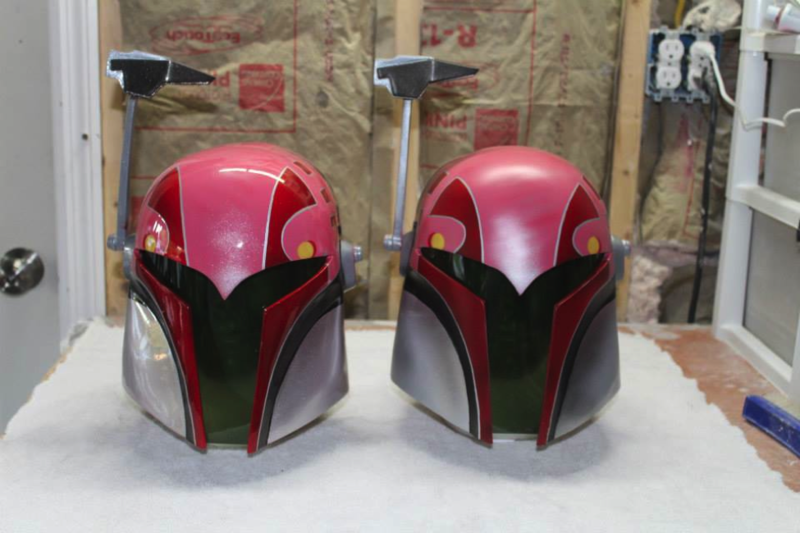 We were shooting on having these helmets ready to present at San Diego Comic-Con in July, along with Honorary Membership into the Mandalorian Mercs Costume Club. A great deal of time, work, and money goes into creating a helmet mold. It helped that Sabine’s helmet is very similar to a Night Owl helmet from Star Wars: The Clone Wars. 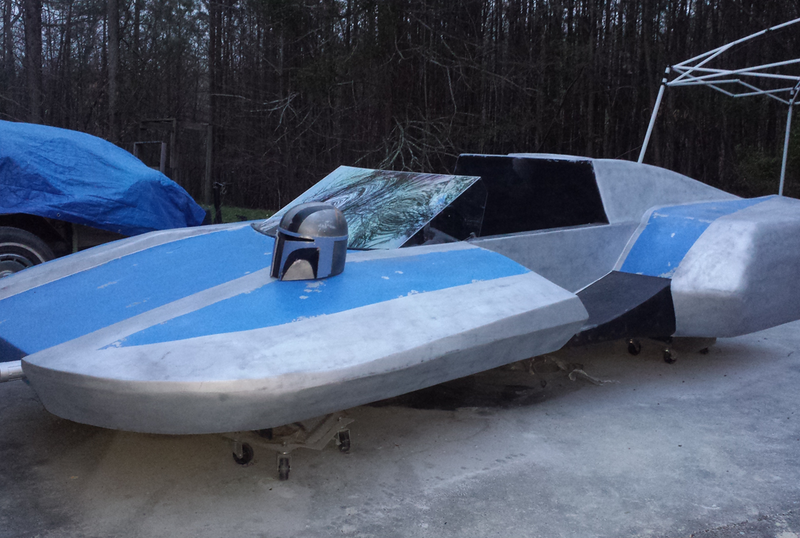 For this specific project, prop maker David White was able to use his existing “Night Owl” Mandalorian helmet as the basis for the Sabine helmet sculpt. Since we had less than four months to get these helmets created, time was not on our side, so David jumped into action getting the master copy finished and casted so there would be enough time to fix any issues that popped up. 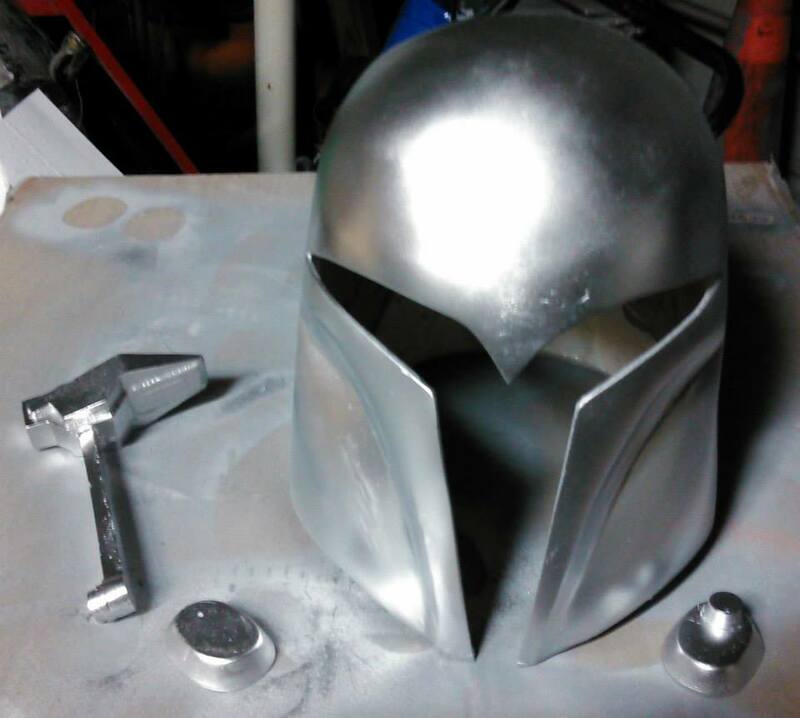 Sabine helmet, primed and coated with metallic aluminum paint in preparation for final painting. Making a prop piece like this requires a fair amount of research to get correct, both in detail and proportions. There are several major differences between the Night Owl helmet from The Clone Wars, and the helmet Sabine wears in Rebels. The most notable being the lack of horizontal ear plates, and the more traditional-style cheeks. 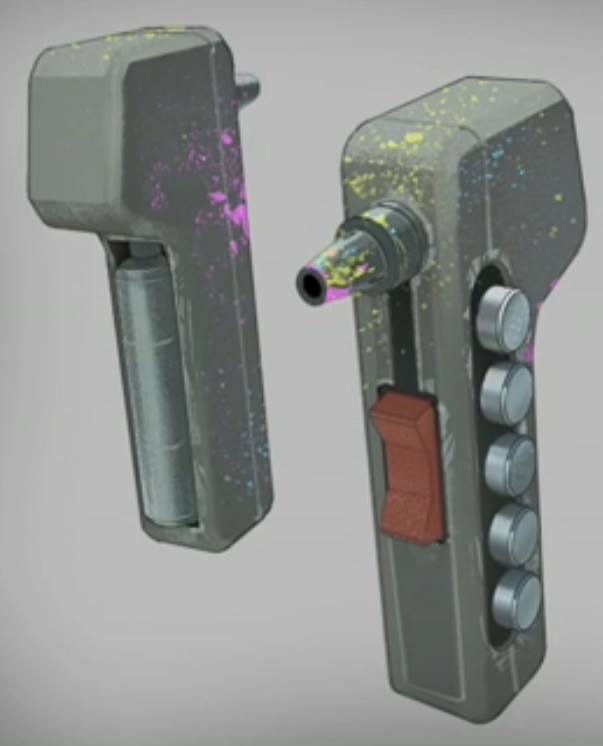 Visual reference used for Sabine’s paint sprayer, used to create the prop. We also decided to include Sabine’s signature paint gun with the helmets, and David used the above graphic as his visual reference for creating the prop device. As is the case with most props, the paint sprayer started out as bits of this and that, which we like to call “greeblies.” You’ll find “greeblies” are on just about every Star Wars costume and prop piece, and they almost always started out as something else…like a plastic model kit, computer plug, or even old dental equipment. 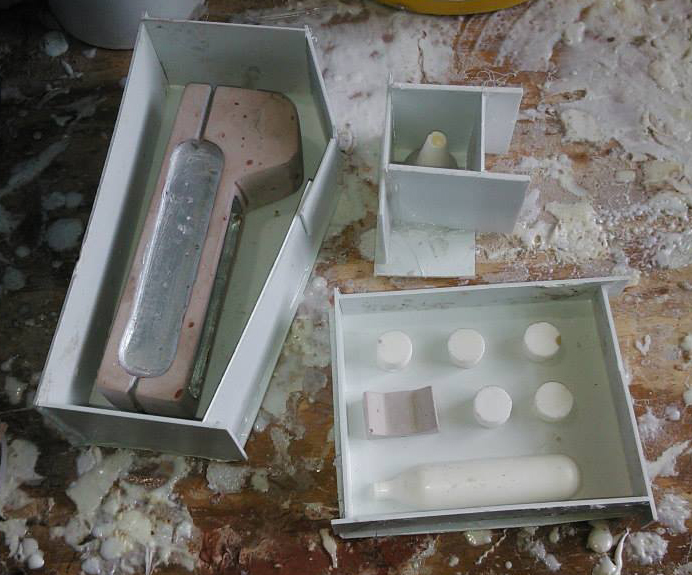 Preparing to create rubber molds for casting paint-sprayer parts out of resin. Once the paint sprayers were ready to go, both the helmets and sprayers were sent off to professional air-brush artist Michael Davis for final painting. David and I both preferred airbrushing to using spray-paint (also called “rattle cans” for the noise made when shaken) for a project this special. Airbrushes offer superior and adjustable control greatly reducing issues like over-spray, bleeding edges, and paint runs. As with the previous items, Michael had only the images and video still existing at the time (which were far less in April/May than we have now) in which to reference for Sabine’s paint scheme. 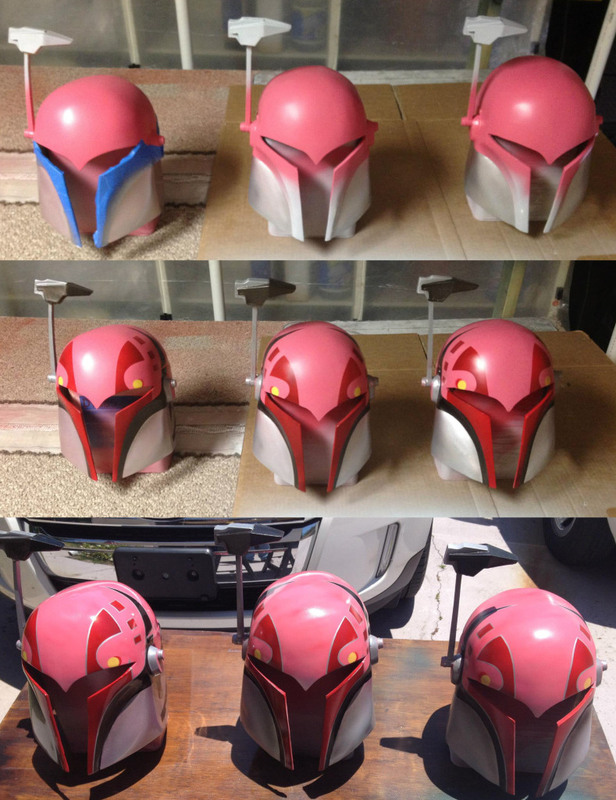 Sabine helmets in various stages of painting. You can see the crisp edges and sharp corners, signature of a great airbrush artist. 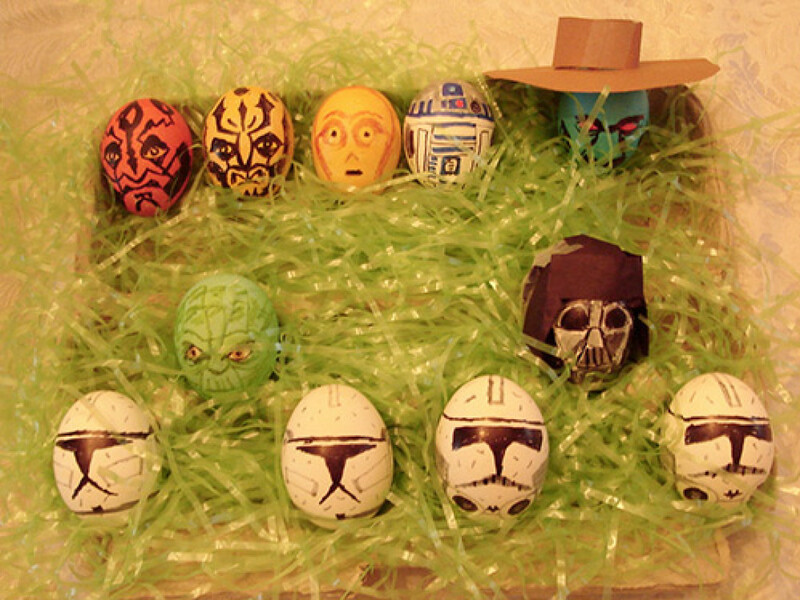 The helmets spent several weeks in the painting process to make sure they turned out as flawless as possible. The finishing touches would be different between the two helmets; Tiya Sircar would get a “weathered” matte helmet (“weathered” means the helmet looks like it’s been lived in), while Vanessa Marshall would get a glossy “new” helmet. 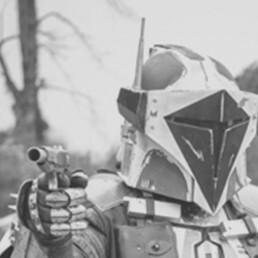 Once painting was completed, the traditional Mandalorian T-Visor was installed and the helmets were ready to be presented. 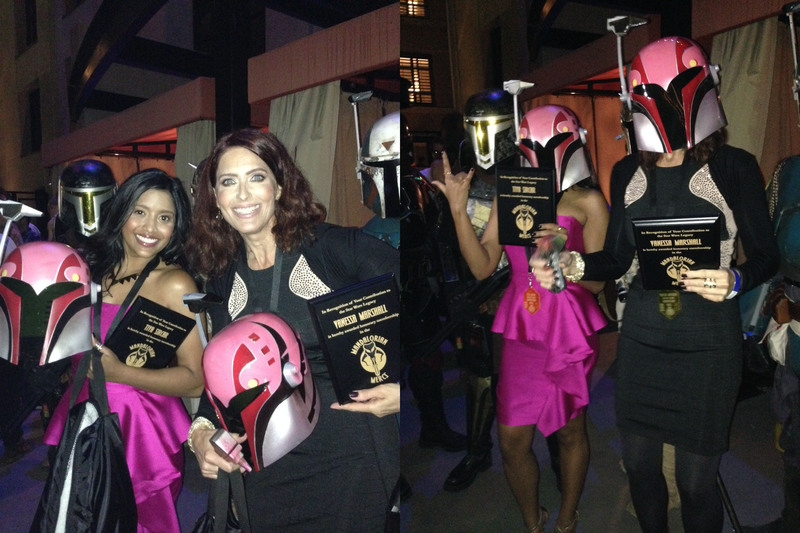 Haran’galaar Clan, the San Diego chapter of Mandalorian Mercs presented these helmets to Tiya and Vanessa at the Star Wars Rebels party on July 23 during San Diego Comic-Con. 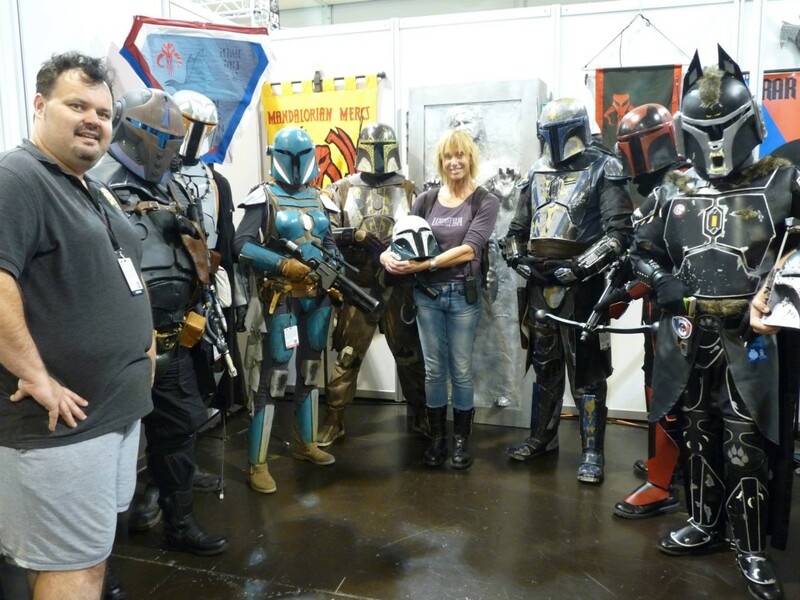 As part of the helmet presentation, both ladies were also inducted as Honorary Members of the Mandalorian Mercs Costume Club. Tiya and Vanessa don their helmets in true Mandalorian fashion. 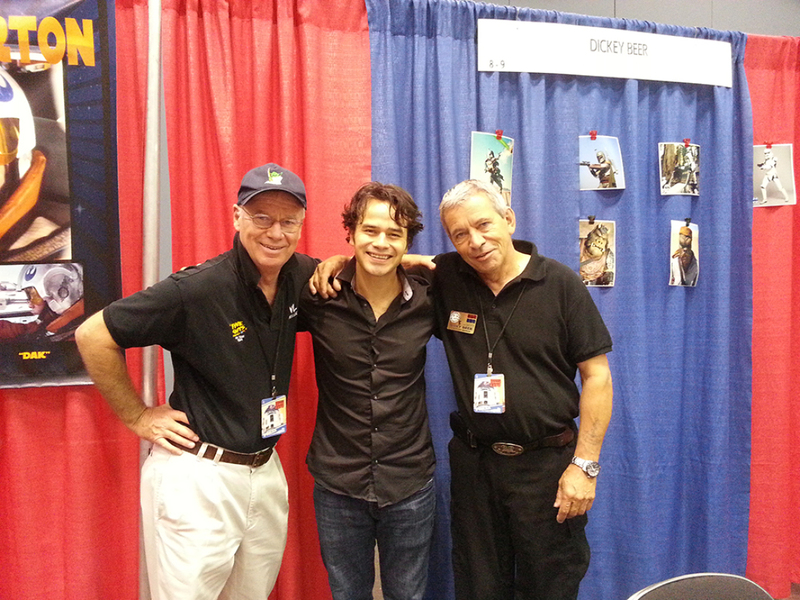 Part of what we do as a fan organization is to thank those who contribute to the Star Wars fandom through their work. 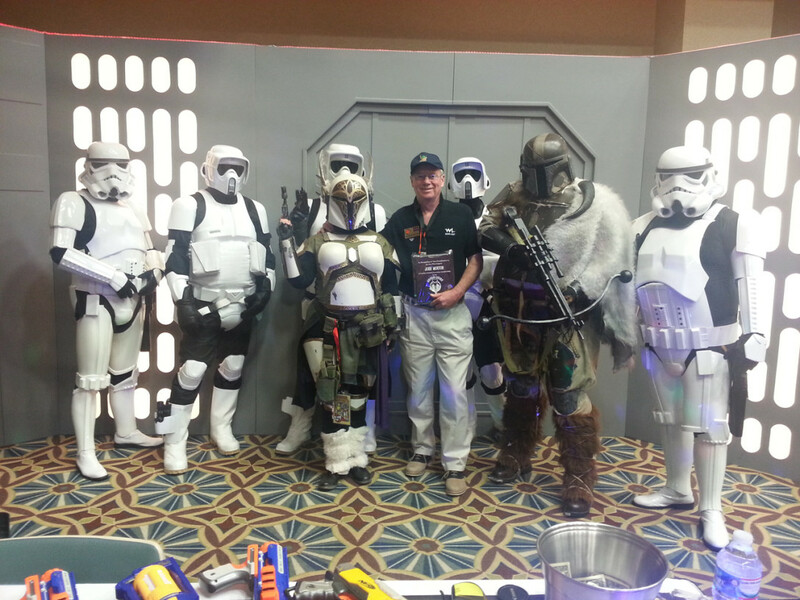 Inducting these individuals as Honorary Members makes them part of the Mandalorian Mercs global family, and it’s our way of letting them know we appreciate what they do.